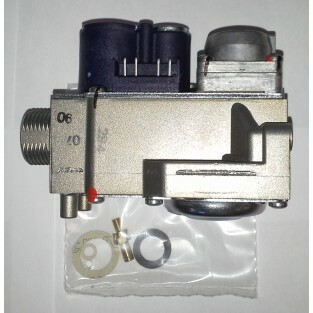 The Bosch AquaStar 2700ES / 2400ES / 2400E / 250SX / 250SXO Gas Valve Part 8707021019 is the replacement Gas Valve for all Bosch AquaStar 2700ES, 2400ES, 2400E, 2400EO, 250SX and 250SXO tankless water heaters. This part is also the replacement for the following: Bosch Therm C1210ESC, C1210ES, C1050ES, C950ES, 940ES, 940ESO, 830ES and the Bosch Greentherm C1050ES and C950ES heaters and the ProTankless C920ESC, C920ES, C800ES, 715ES, 635ES and 635ESO tankless water heaters as well as the Integra 500 and Evolution 500 tankless water heaters. This Bosch Tankless replacement part is Non-returnable.